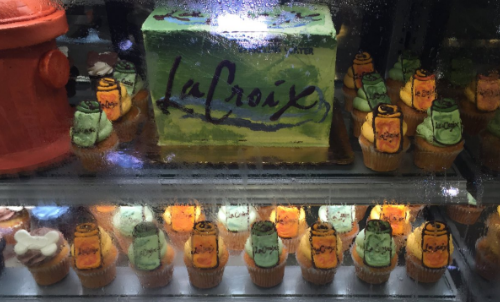 Despite a cult-like following from the Brooklyn hipster demographic and a general growing popularity in recent years, LaCroix beverages (owned by National Beverage Corporation, trading under ticker FIZZ) is suddenly being portrayed as "old hat" due to the surging phenomenon of CBD drinks. Exhibit A: Consider this article published last November in "Bon Appétit," an American food and entertaining magazine that is published monthly by Condé Nast. The title of the article reads, "These Sparkling CBD Drinks Have Replaced My La Croix Habit For Good." 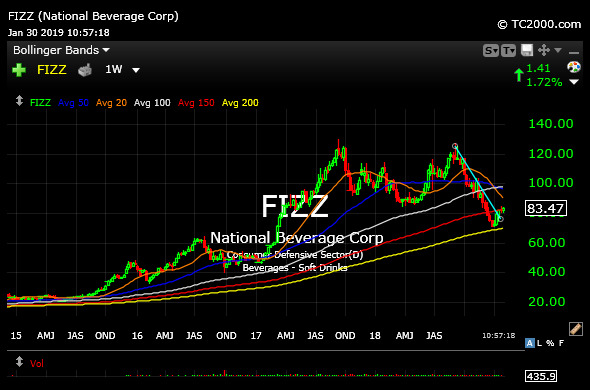 Needless to say, that is not what FIZZ shareholders want to see, nor anyone else associated with the company. Moreover, that article is not an isolated incident--There have been quite a few articles published along the same lines, in so many words declaring LaCroix to be, more or less, over, while CBD is the new hot trend to ride. With this in mind, perhaps FIZZ will feel pressure to pivot into CBD drinks, using LaCroix to leverage the trend instead of sending in stark contrast to it. FIZZ remains rather heavily-shorted, and if they fail to adapt one can envision a scenario where shorts move in for the kill and really bang down the stock. On the FIZZ weekly chart, updated below, the correction since last September is a bit stretched to the downside, with bulls making modest progress in recent weeks. Earnings are not scheduled until March, and a further squeeze is not out of the question. But the issue with FIZZ may very well hinge on if they keep up with the times. Names like NBEV have benefitted handsomely from adapting to CBD. And FIZZ may consider doing the same in light of the face that the market often harshly punishes what it deems to be fads which are past their prime.